We Are Chester’s Angela Ferguson heads to the newly opened Storyhouse cultural centre to watch inaugural production, The Beggar’s Opera. Cast photos by Mark Carline. If it’s a rip roaring tale of bawdy goings on in old Chester that you’re after, then look no further than the opening production of the brand new Storyhouse cultural centre. The Beggar’s Opera is an action-packed musical look at life in 18th century Chester and is based on the classic anti-opera by John Gay which was first performed in 1728. John Gay designed it so as to rail against the popular Italian operas of the time and to appeal to a much wider audience, weaving in folk songs rather than arias. This worked and the original production was so successful that it brought in enough money to build a new theatre in Covent Garden, the predecessor to the Royal Opera House. In this production, the music is a modern day accompaniment to this 18th century tale, composed and directed by Harry Blake, with the story adapted – and packed to the rafters with laugh out loud moments – courtesy of award-winning writer Glyn Maxwell. It’s certainly more than worthy of being a recipe for success for this brand new theatre, housed within the £37m Storyhouse cultural centre in the heart of Chester. As we have come to expect from Storyhouse through its Grosvenor Park Open Air Theatre productions, a stellar cast of consummate performers take to the stage and transport us via words, song and dance back in time. We are taken back to a Chester where, unless you are one of the privileged few, it is a battle to survive. And be prepared for a hefty dose of bawdy raucous jokes and language, making this a production which is definitely suitable for an adult audience only. The production takes a bittersweet look at the lives of both the oppressed and the oppressors as they fight for survival on the mean and unforgiving streets of the city. We meet highwaymen, immoral gang leaders and their long-suffering families, prostitutes, wandering minstrels and a rather loveable rogue of a beggar who is our narrator for this gripping rollercoaster of a story. Our cheeky chappy (Caolan McCarthy) proves himself to be versatile indeed, going from filling the stage with his charismatic dramatic presence to powering away on the piano or guitar or singing a catchy melody with equal aplomb. We also note with great glee the regular references to places we know and love in Chester, from the racecourse and the River Dee to the homes of Curzon Park and the no doubt bursting at the seams Northgate Gaol. Rather appropriately, of course, Storyhouse itself also gets a mention. We are swept away with the action playing out in front of us, as well as the stunning array of 18th century costumes worn by the multi-talented cast. And fair play to the actors, it must be hard to open a new show in a brand new theatre like Storyhouse, knowing that the very building itself is also vying for the affections of the audience, given its stunning architecture and decor. 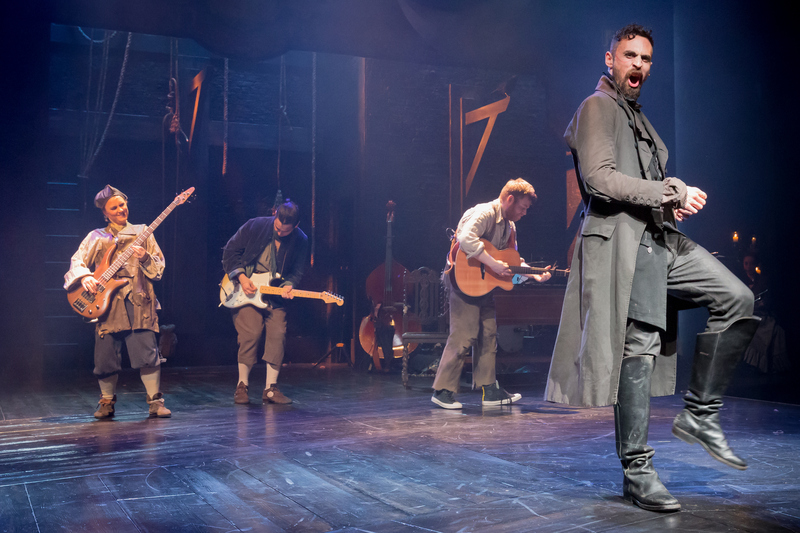 This production is a joy from start to finish – the Storyhouse rep company are equally at home dancing as they are singing, acting and playing a variety of instruments, from a double bass to the haunting tones of a lone trumpet. Indeed, there are some rather gorgeous harmonies in the performance, with a range of mesmerising and enchanting voices filling the theatre. Another talented performer to mention at this point is Tom Connor, who not only lends his hand to playing a male and a female role (Suky Tawdry and Ben Budge), but also confidently wields a rocktastic electric guitar, which brings this 18th century musical full throttle into the modern day. Also in a rather un-18th century vein, we have a drum kit and a rather hip bass player. When the show begins, we are greeted by a stage adorned with golden glowing candelabras, revealed amidst an eery mist of dry ice. We are treated to an enchanting burst of harpsichord music, before our hero, the loveable rogue that is our narrator, the beggar (Caolan McCarthy) sets foot on stage. We are also skilfully drawn in to the love triangle – and some – that is dashing highwayman Macheath’s tangled love life. Macheath, also known as Mack the Knife, is an absolute charmer – and he knows it – enjoying dalliances with quite a number of women. He also makes his living by leading a gang of thieves. Amongst his admirers are the somewhat innocent Polly Peachum (Charlotte Miranda-Smith), who thinks her dad runs a thriving lost property business, and the rather more streetwise Lucy Locket (Nancy Sullivan), who falls pregnant as a result of her dalliances with Mack the Knife. Meanwhile, Polly’s criminal mastermind dad Mr Peachum (Daniel Goode) sees a new business opportunity when he hears of this, knowing that Mack the Knife could be worth more to him dead than alive. For a man who is comfortable letting the toss of a coin decide whether someone will live or die, it’s no big deal to think about sending his daughter’s love interest on a one way trip out of Chester – and we’re not talking a day out at Cheshire Oaks here. He’s encouraged in his evil plans by his loud and somewhat raucous wife Mrs Peachum (Charlotte Gorton), who sees a mountain of threepenny bits in front of her eyes when the idea is agreed. A plan is hatched and mayhem ensures. What will happen to our heroes and villains? Polly calls on the wise counsel of the rather sweet and meek and mild beggar with a conscience, Filch, played to perfection by Baker Mukasa. There are some superb comedy moments, including the regular updates on how long the immoral Mr Peachum will be away doing what is politely termed ‘business’, which was on one occasion to last 56 minutes precisely. We also loved Mack the Knife’s response to hearing from Polly that he was in danger of facing the gallows, quipping, “that’s a damper on the honeymoon”. And prepare for some epic sing offs as the cast demonstrate just why they have been chosen to be part of the groundbreaking Storyhouse rep company. There are also some wonderful quirky moments where the fourth wall is well and truly broken and the audience get to have their say on a few matters. We won’t spoil it by saying any more, suffice to say that if you get the chance then you must go. The Beggar’s Opera is, like the 18th century corsets featured within it, bursting with talent and wonderfully anarchic and surreal in places. The talent on show ranges from those working behind the scenes to bring the at times earthy and at others truly decadent stage set to life (Jess Curtis) to those who mastermind the sound and lighting (Ben Harrison and Rob Halliday), the music (Harry Blake), the groovy moves (Jennifer Fletcher) and the epic fight direction from Philip D’Orleans. We would also like to give artistic director Alex Clifton a special mention for his creative direction for this production, assisted by John Young and trainee director Harry Warren. Team Storyhouse have excelled here, breathing new life into this hilarious adaptation from the pen of award-winning poet, playwright and novelist Glyn Maxwell, who has worked with Storyhouse and its earlier incarnation, Chester Performs on a number of productions, including Wind in the Willows. We also want to give a special mention to the front of house and catering team, the programming, engagement, school and communities team, and the marketing and PR team at Storyhouse, for doing such a superb job of ensuring that our new cultural centre is a warm and welcoming ‘home’ for residents and visitors to Chester. As Storyhouse proudly proclaim, ‘Our house is your house’, and we certainly get that feeling when we visit. It is stunning and will hopefully be a beacon, shining a light on all of the other excellent cultural work that is happening in the city. We are fortunate, indeed, to have such a venue in Chester. It truly is a jewel in the crown of our city and perfectly complements our existing excellent cultural offering. We can’t wait to see what’s in store at Storyhouse next, with forthcoming productions including Alice in Wonderland, A Midsummer Night’s Dream and Julius Caesar. The Beggar’s Opera runs until Saturday 19 August. To book call 0844 815 7202, go online here or call into Chester Visitor Information Centre.